Students who choose to study at Middlesex University are more satisfied with their experience than ever before, the latest National Student Survey has revealed. In 2014, 85 per cent of the current students who took part in the questionnaire responded positively when asked about their course at Middlesex, up three percentage points on the previous year and eight percentage points higher than in 2012. This strengthening performance in the annual national survey, conducted by Ipsos MORI, outstrips the pace of the improvement for the higher education sector overall and coincides with a wholesale transformation of the University, which has seen the development of the flagship Hendon campus, complete with state-of-the-art facilities. Alongside these overall figures, there were also some outstanding individual results, with 12 of the subjects taught at Middlesex attainting a 100 per cent student satisfaction rating and a further 30 scoring in the 90s. To compile the figures, Ipsos MORI asked respondents a series of questions relating to areas such as teaching and personal development. An additional section focused on career prospects – an aspect of the University experience that is increasingly important to students in the wake of the tuition fee rise. 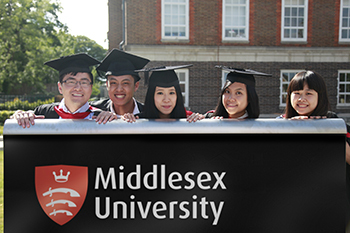 In all, 87 per cent of Middlesex students said they felt their employability had improved during the course of their studies – up three percentage points year-on-year and a reflection of the University's continuing efforts to build strong links with industry partners and create increased opportunities for internships and placements for students. Unsurprisingly, as a result of these developments in key areas, the number of students who said they would recommend Middlesex to family and friends rocketed this year – up eight percentage points to 84 per cent. This excellent student feedback comes just weeks after the University saw significant gains made in the Guardian University Guide and, for Vice-Chancellor Professor Michael Driscoll, these positive results are testament to an approach that sees sheer hard work allied to an ambitious vision for the future. "Every member of staff at Middlesex adopts a student-first approach and I think that is reflected in the latest survey results," Professor Driscoll said. "We've improved our student survey score in each of the last three years, but we don't want to stop there. Our aim is to become one of the top ranked universities in the UK, and we'll keep striving to achieve that goal."